I spotted this engine at the Highlands and Islands Fire brigade workshop in Inverness. The old Northern Ireland Fire Authority Dennis F8 appliances had an "Ulster" badge put on the front by Dennis when they bought a large number for their "rural" retained stations. Although the older first delivered appliances didn't have the badge. Added by Bryan Sweeney on 11 November 2006. This appliance is suitable for rural firefighting role. Added by Bomba Boy on 29 November 2006. Was this picture taken in 2006? How was the condition close up? Did it look as if it was still in good condition? Added by Andy on 20 May 2008. Added by Marcel on 20 May 2008. Thanks for that, this appliance was first based at King Street in Aberdeen before transferring to Nairn as part of the Pre-1975 North eatsern Fire Brigade. Nairn became part of Highlands and Islands Fire Brigade and that's why it ended up in Inverness. This vehicle is currently for sale if anyone is interested. I thought about it but due to other commitments, baby on the way and no room to store it there's no point in buying it! It's on the UK Auto Trader Website and I hope it gets a good home!! Added by Andy on 25 May 2008. Just to let you know that I have bought the Dennis F8 to join my collection of vintage vehicles in Malta GC. The old girl will be fully restored by early next year and will be exhibited (on loan) with the Malta Historic Vehicles Trust. Added by George Said on 24 November 2008. Added by Barrie Green on 25 November 2008. George, Congratulations! Are you going to restore it as Malta pump or leave it as North Eastern Fire Brigade/Highlands & islands Fire Brigade? Added by Andy on 25 November 2008. I'm not sure yet - basically I have the option to restore it as an Admiralty Fire Engine or to leave it as it is. the Royal Navy version would be more relevant and representative of what served in Malta. However, I am most undecided. Added by George Said on 26 November 2008. Just a short note to let you know that on Christmas Eve KSA363 arrived safely in Malta and that restoration work is already underway on her! She has had her braking system serviced and tomorrow she should be started up. Tomorrow work on her body will commence also. I mst note that I managed to acquire her through the help of Mr Aidan Fisher of HCB Angus fame who sourced and inspected the vehicle on my behalf! Hopefully she should be completed in March! By the way, as you can see her front wheels seem to be wrong as they are obviously bedford rims. If anyone knows where I can get two front dennis wheels please do let me know! Added by George Said on 28 December 2008. I do love the f8's i work for cheshire FRS and have worked on (and restored) their dennis f7 runs beautifully! gorgeous machines, im also working on a leyland the service have acquired. Added by Steve Woolham on 17 June 2009. Added by Stevie Murray on 25 September 2009. Just a short note to let you know that this dennis has been undergoing restoration since Christmas 2008 and is now nearly ready. It has been mostly rebuilt as the wooden structure was largely rotten. However, much of its original parts were retained including all the aluminium cladding, etc. It should be ready very soon and I will be sending you photos of how it was. Added by George on 27 September 2009. Thanks for the update George and good luck with it. I wonder if I can ask if you have any information on the four Ford D-Series appliances that Norfolk Fire Service (UK) sent to Malta for further service? Have any survived to be preserved and if so, what condition are they in please? Added by Chris Wood on 27 September 2009. I will keep you updated if we manage to acquire the old girl! Added by George Said on 28 September 2009. Thank you for that George. I have enjoyed looking at your website in the last year or so and had seen a reference to a D-series but didn't know if it was one of 'ours'. I wish you success in your quest to save her. Added by Chris Wood on 29 September 2009. You mention the wheeltrims, looking like Bedford type, those fitted are the originals, fitted by Dennis. I once had to buy a pair for my F8. Good luck with the restoration. Added by Mike Williams on 20 November 2009. F8 TLG 328 ex Rolls Royce Crewe works appliance now on long-term display at the North West Museum of Road Transport St Heles Lancs, excellent condition and fully equipped. Added by Geoff on 11 February 2012.
anyone visiting up North The Museum in St.Helens is well worth a visit as they have a number of appliances on display, and if you want a cuppa it is served form a NFS Canteen Van. It is only open on Weekends though. Added by Dave Price on 12 February 2012. The North West museum of Road Transport at St. Helens (to give it it's full title :-)) will be holding an emergency services event day on 4th March if anyone is interested. Being local, I'll hopefully be there with my police Omega and paramedic ST1100. Added by Carl McKenna on 12 February 2012. Added by Glenn Morson on 20 May 2012. The short answer is yes, they did. One from East Ham (KHV 921) and a number from Middlesex come to mind. All Dennis F8 appliances that were wholly made by Dennis were Pumps (ie: less thasn 400 gallon capacity) and not WrTs. The only F8s that were WrTs were the Miles bodies ones that were of an entirely different appearance. Returning to wholly Dennis manufactured ones, only three were PEs, one for Jersey and two for Northern Area. I'll post a Middlesex example in LFB livery. Added by Ian Moore on 21 May 2012. Hi Glenn, the answer to your question is no the LFB did not use the Dennis F8.The first post-war appliances to be ordered were the Dennis F7's and Dennis F12's and these could be used as either a (pump, or a pump escape)using the Roll-Royce B.80 six cylinder petrol engine.The London Fire Brigade lead the field in the development of the diesel engine for fire appliances, one pump being fitted before the war.Although the first new post-war appliances were fitted with petrol engines, the next series of replacement appliances were to be fitted with diesel engines, these being the AEC Regents and the Dennis 101's. Added by Pete Matten on 21 May 2012.
thanks Ian and Pete, now I'm some what confused with the conflicting answers. I know LFB may have inherited some with the expansion of GLCC but I'm guessing that they where nether marked as LFB is that correct? Added by Glenn Morson on 21 May 2012. 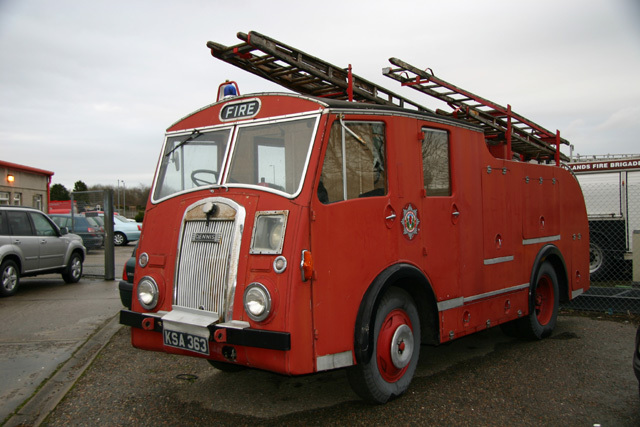 I believe I'm correct in saying that at no time did the LFB actually ever purchase any Dennis F8's during the 1950's-early 60's, they only actually inherited from other brigades on the expansion(boundary changes to the Greater London area)of the London Fire Brigade during the mid-1960's. The expansion of the Greater London area saw parts of the counties of Kent, Essex, Surrey and Middlesex, and with the stations transferred come many of the appliances that had been used by the brigades mensioned, some of course being the Dennis F8's. Glen - Pete's above message explains the situation perfectly. The original LFB didn't have any F8s, but the acquired a number from the brigades that they absorbed when GLC came into effect, which is what I meant in my message when I mentioned East Ham and Middlesex. Added by Ian Moore on 22 May 2012. Added by JH Thrower on 18 July 2012. Hi I am looking for a Delco Remy distributor for our Dennis F8 year 1956. I also need the cap. Added by Pat Kirwan on 29 October 2014.